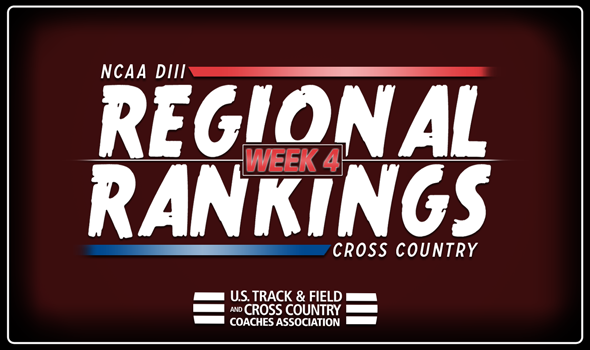 NEW ORLEANS – Changes reverberated through the newest NCAA Division III Cross Country Regional Rankings that were released Tuesday by the U.S. Track & Field and Cross Country Coaches Association (USTFCCCA). There is one new No. 1 team in the men’s rankings and a handful of teams that moved up to No. 2 in their respective regions in both the men’s and women’s rankings. RPI and SUNY Geneseo remain in control in the men’s rankings after winning their respective meets this past weekend. The Engineers cruised to the team title at the Saratoga Invitational, while the Knights earned the win at the Mike Woods Invitational. Behind those teams, St. Lawrence moved up to No. 3, RIT dropped to No. 4 and Rowan moved up two spots from No. 7 to No. 5 between Week 3 and Week 4. SUNY Geneseo tops the women’s rankings following a victory at the Mike Woods Invitational. St. Lawrence and RPI swapped spots, while Rochester (N.Y.) vaulted two spots from No. 6 to No. 4 between Week 3 and Week 4 after a strong effort at the Paul Short Run. Vassar remained in place at No. 5. Just about everything changed in the top-5 of the men’s rankings in the Central Region. Head-to-head competition has a way of doing that. Wartburg went from No. 2 to No. 1 after scoring just 35 points in a dominant win at the Dan Huston Invitational. St. Olaf and former No. 1 Carleton squared off at the Blugold Invitational with the former coming out on top, which slotted them in at No. 2 and dropped the latter to No. 3. St. Thomas (Minn.) jumped from No. 6 to No. 4 after a runner-up performance at the Dan Huston Invitational and Loras remained at No. 5 for another week. There were a few changes to the top-5 of the men’s rankings in the Great Lakes Region. Calvin remained No. 1, but Otterbein and Case Western Reserve closed the gap behind it. The Cardinals won the NCAA DIII portion at the All-Ohio Championships, while the Spartans finished runner-up at the same meet. Trine remained No. 4 and John Carroll vaulted three spots from No. 8 to No. 5 after finishing third at the All-Ohio Championships. Hope and Calvin remained No. 1 and No. 2 in the women’s rankings and are trailed by Otterbein, a team that moved from No. 4 to No. 3. The Cardinals easily won the NCAA DIII portion of the All-Ohio Championships. Allegheny (Pa.) is now No. 4, while Case Western Reserve dropped two spots to No. 5. The top teams in the Mideast Region squared off at the Paul Short Run this past weekend. The rankings reflect their finishes as a team. Haverford finished 10th, just 14 points ahead of Carnegie Mellon, which is now No. 2. Johns Hopkins finished a distant 19th, nearly 200 points behind the Fords and Tartans. Dickinson and Stevenson didn’t move from the past week as they are No. 4 and No. 5, respectively. Nothing changed in the women’s rankings in the Mideast Region as the top-5 remained intact. Johns Hopkins is still No. 1 after a truly strong effort at the Paul Short Run (seventh place in the Gold Race), followed by No. 2 Dickinson, No. 3 Carnegie Mellon, No. 4 Swarthmore and No. 5 Haverford. North Central (Ill.) continues to reign in the Midwest Region. The Cardinals remained No. 1 after winning the top race at the Louisville Cross Country Classic. UW-La Crosse and Washington (Mo.) swapped spots after going head to head at the Lakefront Invitational in Chicago, in which the Eagles finished ahead of the Bears. U of Chicago and UW-Stout remain No. 4 and No. 5 for yet another week. There were a few changes in the women’s rankings, but not up top as Washington (Mo.) still headlines the group. UW-Eau Claire jumped one spot from No. 3 to No. 2 after winning the Blugold Invitational. Wheaton (Ill.) moved up one spot from No. 4 to No. 3 after a third-place finish in the Blugold Invitational. North Central (Ill.) jumped two spots from No. 6 to No. 4, while U of Chicago remains at No. 5. Very little changed to the men’s rankings in the New England Region. Williams is still No. 1, followed by No. 2 Middlebury, No. 3 Amherst and No. 4 MIT. Bowdoin jumped four spots from No. 9 to No. 5 this week after winning the Maine State Invitational. There were no changes to the top-5 of the women’s rankings. MIT is No. 1, followed by No. 2 Williams, No. 3 Tufts, No. 4 Middlebury and No. 5 Brandeis. Rhodes still might be No. 1 in the men’s rankings in the South/Southeast Region, but Berea (Ky.) is gaining on its heels. The Mountaineers finished 12th in the Blue Race at the Louisville Cross Country Classic this past weekend. Emory dropped one spot from No. 2 to No. 3, while Washington and Lee remained No. 4. Christopher Newport dropped two spots from No. 3 to No. 5. Emory is still No. 1 in the women’s rankings, but is followed by a new No. 2 team – Lynchburg. The Hornets took over the No. 2 spot from Centre, which fell to No. 3. Washington and Lee is still No. 4, followed by Trinity (Texas) at No. 5. There were no changes to the top-5 of the men’s rankings as Pomona-Pitzer is No. 1, followed by No. 2 Claremont-Mudd-Scripps, No. 3 UC Santa Cruz, No. 4 Occidental and No. 5 George Fox. There were a few changes to the top-5 of the women’s rankings as UC Santa Cruz and Occidental each moved up one spot to come in behind Claremont-Mudd-Scripps and Pomona-Pitzer. Colorado College fell two spots from No. 3 to No. 5.